3 Appaloosa Lane, Rolling Hills, CA.| MLS# PV18087257 | Southern California Homes for Sale. Search properties Southern California. 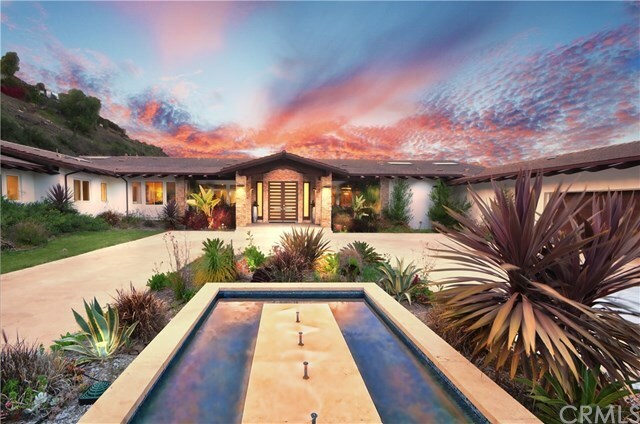 This 21st century modern masterpiece is located within the gated and 24 hour guarded city of Rolling HIlls. One of the most prestigious homes designed by the famous architect Criss Gunderson,completed and ready for the new owner!! This home has lovely views of the vibrant city and mountains with total privacy!Short distance to LAX and all the LA metro facilities, but it feels like living in a mountain thatâs so close to nature. This single story residence combines quality modern materials with the luxury amenities worthy of a five-star boutique hotel, it sets amid a vast landscaped garden with a huge swimming pool and spa.The homeâs sumptuous master suite has his and her separated bath and closet, while 4 additional suites each feature privacy on their own wing with a media room.You will also find a gym and a library. Huge living, dining and great room are all designed for comfortable everyday living and entertaining, high ceilings thru out with lotâs of glass doors/windows.Huge patio area around the pool with fireplace, TV screen, fire pit and full out door kitchen, sauna and a pool bath. A wine cellar for storage of about 900 bottles,also an additional suite on the other wing of the home for a visitor or caretaker. All these with a 6 car garage with A/C and best of all, all on one level and turnkey!! You will never see another great opportunity like this again!! Reduced from $10999000 to below cost at $7188000, must sell!